Not only is Turkey’s breathtaking Mediterranean coast home to numerous UNESCO cultural heritage sites, it also delivers heavenly beaches and jaw-dropping scenery. Set like a jewel in a tiara of magnificent pine forests, you’ll find the Zeynep Hotel nestled by the sea and beckoning to you like a mirage. It is a dream come true for families who want to spend some quality time together. Whatever your thing might be, you’ll find it here. And at the end of the day, you can enjoy Turkish hospitality, dance at the disco – or just sit quietly at the beach bar. Belek is a charming and unspoilt town on this newly emerging holiday region on the Turkish Riviera. Filled with spacious and beautifully maintained gardens, Belek offers romantic dunes and fragrant pine forests, as well as miles of beaches that invite you for memorable strolls along the crystal clear sea. For the active ones, Belek is the ideal destination for water activities and golf. The Antalya airport is 30 km away from Zeynep Hotel. Transfer takes only 30 min and is not included in hotel booking. Listed Golf Package prices for SENTIDO Zeynep Golf & Spa are based on All-Inclusive Meal Plan. The Zeynep Hotel features 375 contemporary and tastefully designed rooms with a view. They are located either in the main building, in bungalows or villas. The 23 m² standard rooms in the main building with country view are suitable for 2-3 guests, including 1 child, and are equipped with air conditioning, balcony in selected rooms, queen size bed or single beds, extra bed, baby cot, satellite TV, fitted carpet, safe deposit box, telephone, mini bar, kettle (on request), hairdryer, slippers, bathrobes (upon request, free of charge), bathroom with shower, WC. A 24-hour room service is available against charge. The 46 m² family suites in the main building consist of 2 connected bedrooms and 2 bathrooms. They are equipped with air conditioning, queen size bed or single beds, extra bed, baby cot, satellite TV, fitted carpet, safe deposit box, telephone, mini bar, kettle (on request), hairdryer, slippers, bathrobes (upon request, free of charge), bathroom with shower, WC. A 24-hour room service is available against charge. The 26 m² standard rooms with country view are in two- or three-storey houses and are suitable for 2-4 guests, including 2 children. These standard rooms are equipped with air conditioning, balcony, queen size bed or single beds, extra bed, baby cot, satellite TV, safe deposit box, telephone, mini bar, kettle (on request), hairdryer, slippers, bathrobes (upon request, free of charge), bathroom with shower, WC. A 24-hour room service is available against charge. The 37 m² family rooms in the main building with balcony are suitable for 2-4 guests, including 2 children, and are equipped with air conditioning, queen size bed or single beds, extra bed, baby cot, satellite TV, fitted carpet, safe deposit box, telephone, mini bar, kettle (on request), hairdryer, slippers, bathrobes (upon request, free of charge), bathroom with shower, WC. A 24-hour room service is available against charge. The buffet restaurant, three à la carte restaurants as well as atmospheric bars at Zeynep Hotel offer so many culinary choices that no wish will go unanswered. The best way to start your day is with a tasty breakfast. Our lavish buffets are set to accommodate you and that also holds true for lunch and dinner. You are in Turkey but in the mood for Chinese dishes? Simply head to our à la carte restaurant and be pampered by the delicacies of China in Antalya! There is no excuse to miss out on the fresh seafood while you are so close to the sea. Be impressed by the culinary delights and fish specialities offerd by our à la carte restaurant. Eating is about much more than just satisfying your hunger! Our restaurants offer both unique culinary experience and enchanting ambience that will altogether heighten that pleasure. We have all been there - hungry between meals. No problem. The hotel offers snacks at the pool and on the beach. And for that sundowner or nightcap, just head to one of our many bars. Beach Bar: 10:00 a.m. - 06:00 p.m.
Disco Bar: 11:00 p.m. - 02:00 a.m.
A selection of food and drinks is included in the All Inclusive package, which is valid until your departure from SENTIDO Zeynep Resort. The family-friendly Zeynep Hotel lies right by the Turkish Mediterranean coast, nestled on a beach before the backdrop of magnificent pine trees and is proud of its openly landscaped garden. Kadriye and Belek are only a few kilometers away and Antalya, 40 km away, can be reached by a comfortable minibus. A long, pristine sandy beach and Blue Flag-awarded crystal-clear waters. What else more do you need for hours of relaxation? But if you are in the more active swimming mode, why not try out our Olympic-sized pool? Or have fun with the kids on the water slides and in the kid's pool. Kids can enjoy lots of fun activities and make new friends at the Mini Club. Splash in the kids' pool, shoot down some water slides or play games in the playroom. We also have a buffet just for the little ones. Nine different golf courses are within 10 km. It doesn't get much better than that for golf enthusiasts! 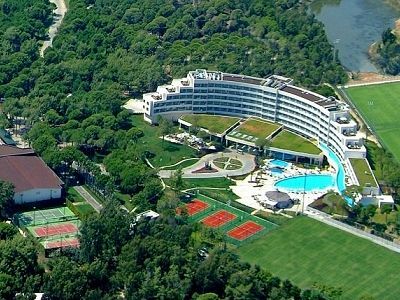 The CARYA Golf Club is only 500 m away from the Resort and we offer free shuttle service for hotel guests. Our affiliated SENTIDO Zeynep Golf & Spa has a storage room for your golf equipment. Grown in an extensive nursery on site, Carya's heather shapes define the course. The course is demanding on strategy with free flowing holes that run between pine and eucalyptus trees and across a dramatic sand ridge. Carya boasts a Player's Course, a world class Golf Academy and spectacular new Club House. The National is an attractive parkland design carved through a forest of eucalyptus and pine trees with natural wetlands bordering the length of several holes and the snow-capped Taurus Mountains as a backdrop. Water hazards come into play on many holes, including the par-four 18th where your approach to the green comes in dramatically across a lake. 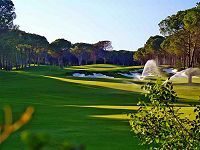 National Golf was the very first golf course in Belek, opened in 1994, and is designed by former Ryder Cup star and leading commentator David Feherty. 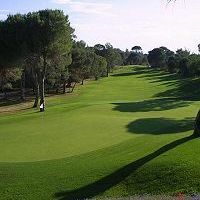 It is current home to the European Ladies Tour, as well as previous host to the European Seniors Tour. Standard Rooms, All-Inclusive, Green Fees as listed, Airport & Golf Transfers, Local taxes.